MANY CUSTOM FEATURES FREE ! Saddle Bums Ultimate Knee Patch Tights are designed with no inner leg seam, a handy inside pocket to stash cash or keys. This very breathable four-way stretch fabric makes this tight highly resistant to tears and snags, while supporting the muscles that keeps the rider less fatigued. 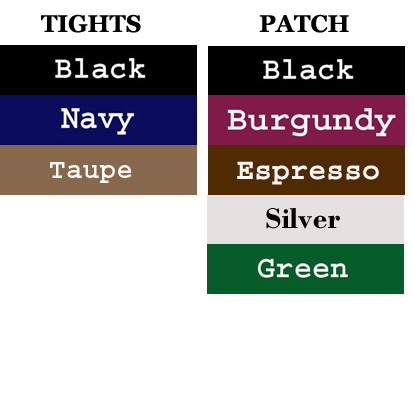 The outer Knee Patch Sueded Clarino extends above and below the knee and comes in 7 color choices to make some truly stunning color combinations.